Not terribly long ago I commented on a picture of some chocolate dipped spoons and noted how easy they were to make. Their reply was enthusiastic, asking if I would create a recipe and write about it. How could I not make them after that? Decorations of choice: such as fondant flowers, non-peril balls, sprinkles, etc. Line 2 baking sheets with parchment paper. Slowly melt the chocolate wafers in a double boiler, stirring until all the wafers are melted (between 88° -90° F to maintain temper). Dip each spoon in the melted chocolate. Thoroughly coat the front and back of the spoon with chocolate. 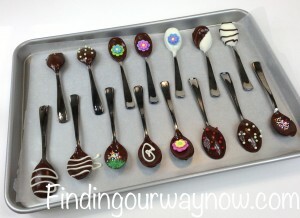 Carefully place the chocolate coated spoons on the parchment paper lined baking sheets. Let the chocolate cool a bit and then decorate. Place the baking sheet of decorated spoons in the refrigerator to set. 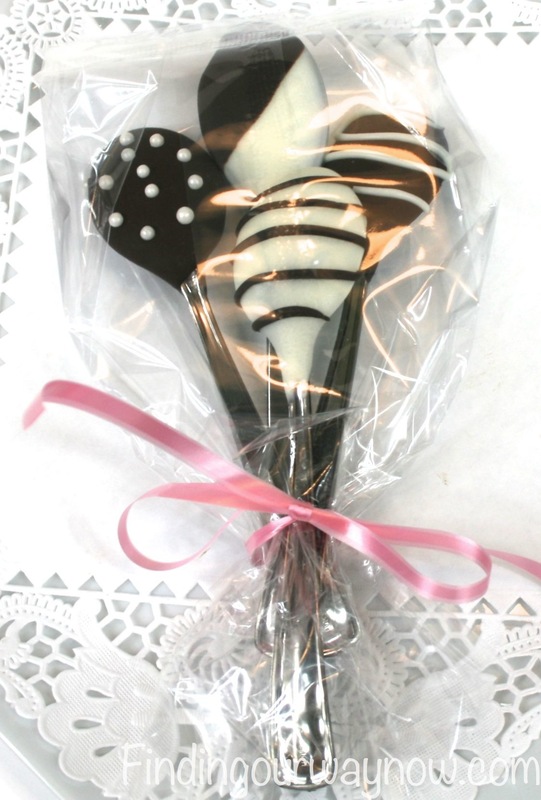 Decorating: Chocolate Drizzles – Take the remaining dark and white chocolate, pour into a ziplock bag and snip off a small point then squeeze to drizzle across the spoons of the alternate color. You can also place any variety of candy decorations or non-peril balls on the spoons until the desired look is achieved. The opportunity for creativity is limitless. So have some fun with this. Notes: Follow the same steps for all the different chocolate flavors. 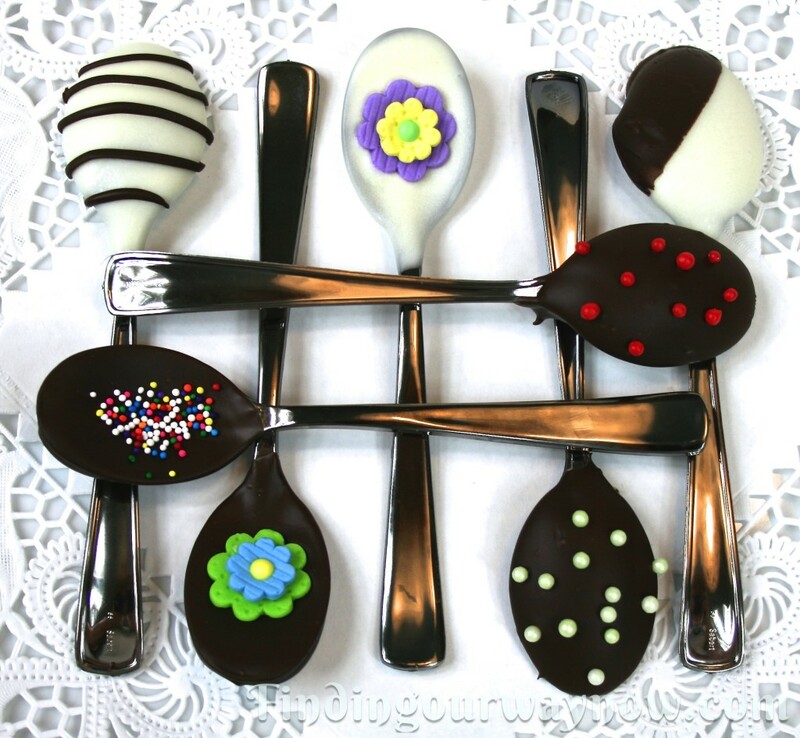 If you’re decorating the white chocolate spoons, decorate them quickly because the spoons will set up faster than dark or milk chocolate. We couldn’t help it. As soon as they were set, my friend and I made some coffee and gave them a try. Oh my goodness, were these ever good in our coffee. They would also be marvelous in hot chocolate. 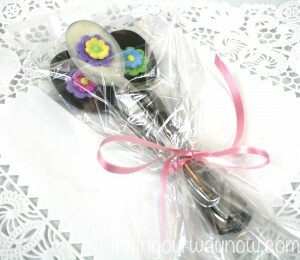 You can package these in clear cellophane bags tied with a ribbon. 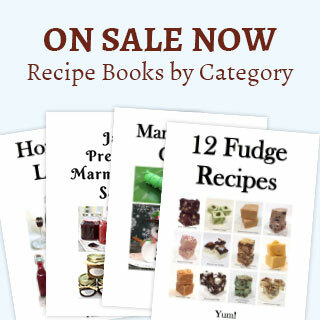 They make terrific gifts for any holiday, friends, teachers, anyone or anytime. Enjoy. 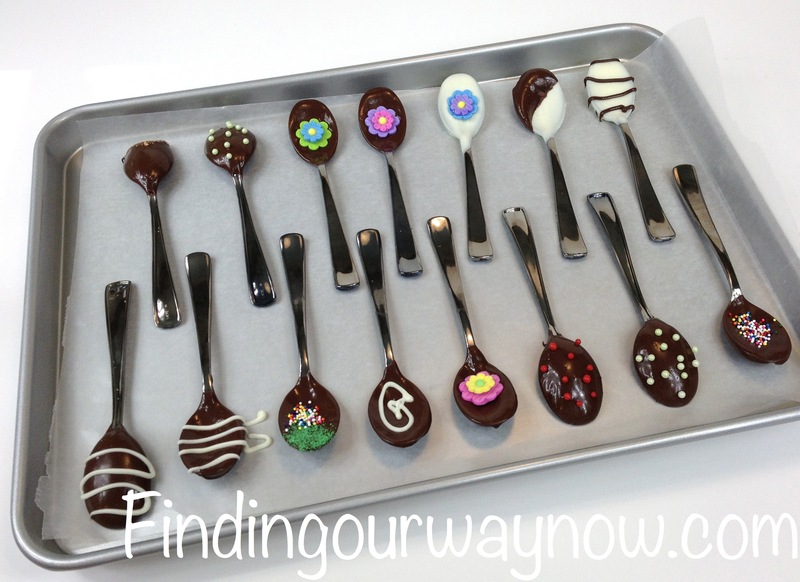 If you liked these “Chocolate Dipped Spoons recipe,” check out my Chocolate Cherry Mice, Homemade Hot Cocoa Mix, and Skinny S’Mores.